So you have paid heed to Melbourne’s history of railway flash flooding, and flood proofed your rail under road grade separation. But there is something you can’t fix as easily – flooding out anyone living beside the train trench. In 2016 the level crossings on the Frankston line at North Road, McKinnon Road and Centre Road were removed, with the railway being placed into a trench between each road, with three new stations constructed at Ormond, McKinnon and Bentleigh. Massive drainage pits were constructed on the uphill side of the rail cutting, to ensure that stormwater would not enter the trench, and stop trains. But given enough rain a massive concrete lined cutting across a natural watercourse will turn into a dam – as local residents found out in December 2016 – the first big storm after completion of the level crossing removal project. An investigation is under way to determine whether a new drainage system installed by the Level Crossing Removal Authority caused the severe flooding of dozens of homes. Residents along Glen Orme Ave, McKinnon, are still out of their houses as the clean-up continues following the December 29 storm. Irate homeowner Aislinn Martin believes new drainage running through Glen Orme Ave, which was constructed during works to remove the McKinnon level crossing, caused thousands of litres of water to sweep through her house. The LXRA installed the drainage to protect the rail trench from flooding, but Ms Martin said that just resulted in her street being walloped with a torrential amount of excess water during the storm. One neighbour, who did not wish to be named, said the flooding occurred because the water was intended to flow into the Elster Creek drain, but, with that already overflowing, it gushed out of the new overflow grates along Glen Orme Ave. Following the December 29 storm, the LXRA sent letters to residents to advise that all newly installed drainage would be checked and the authority would notify them on the outcome of the investigation. Local member and Liberal MP Georgie Crozier raised the issue in Parliament on 21 March 2017. My adjournment matter this evening is for the minister responsible for the removal of level crossings, Minister Allan. I have raised on a number of occasions issues in relation to the level crossing removals at North Road in Ormond and McKinnon Road and Centre Road in Bentleigh. This matter relates to the level crossing removal in Ormond and involves the works undertaken for drainage. We have had another weather event today. I believe there are a number of areas in metropolitan Melbourne that have been flooded, and I do hope that there is no ongoing damage from the rains today. On 29 December significant flooding occurred in Melbourne and across the state from which there was significant damage in the Ormond area and also in the neighbouring area of McKinnon, where significant amounts of water were coming out of the drains that were put in place to cope with the extensive drainage from those level crossing sites. Nevertheless, my issue concerns, as I said, the North Road area. Many residents have written to me and expressed their concerns about what has actually happened in terms of the pipes and various construction dealing with these drainage issues, with the Level Crossing Removal Authority (LXRA), Melbourne Water and the local council. All of these residents have been told that significant work was done, that everything was okay and that the LXRA had undertaken some investigation and found that the system was operating as it was designed to. However, there are still some concerns held by various residents who have not had many of their queries answered to their satisfaction. One of the areas of concern relates to all of the piping and the drainage that was laid during the construction phase and what other areas may be affected by this. The action I am seeking from the minister is that the investigation and the report by the LXRA on these works be made public so that the affected residents can understand fully what consultation with Melbourne Water and the Glen Eira City Council was undertaken and what works actually took place to cater for future flooding, because we will get future rain events which will be greater than the last one. If the minister could provide that to the public, that would be most helpful. With the Level Crossing Removal Authority publishing their report into the flooding in September 2017. Throughout 2017 Melbourne Water and the Level Crossing Removal Authority have undertaken a joint review of flooding that occurred as a result of intense rainfall on 29 December 2016 and how the drainage system installed as part of the North McKinnon Centre Level Crossing Removal Project operated during the storm event. The drainage works needed to enable the level crossing removal at Ormond and McKinnon were very complex to design. The passage of the rail corridor through the floodplain and the established character of the area limited drainage design options. Significant planning and care was taken to ensure the drainage design for the North McKinnon Centre Level Crossing Removal Project did not make flooding worse. • All affected properties are within the envelope of flooding predicted by our modelling both pre and post construction of the drainage. • As a result of the construction works, many properties will in fact have experienced lower flood levels through the December event than would have been experienced pre-construction. These properties are primarily upstream of the railway works. been contacted directly and are located in Elm Grove and Glen Orme Avenue. As part of the Project, significant drainage infrastructure was installed and existing assets altered. The drainage infrastructure and alterations have been designed to replicate the pre-existing (prior to project) flood conditions in the area. The drainage infrastructure and alterations have been designed to replicate the pre-existing (prior to the project) flood conditions in the area. As part of normal flood mitigation activities, Melbourne Water has initiated a project to evaluate localised mitigation opportunities. 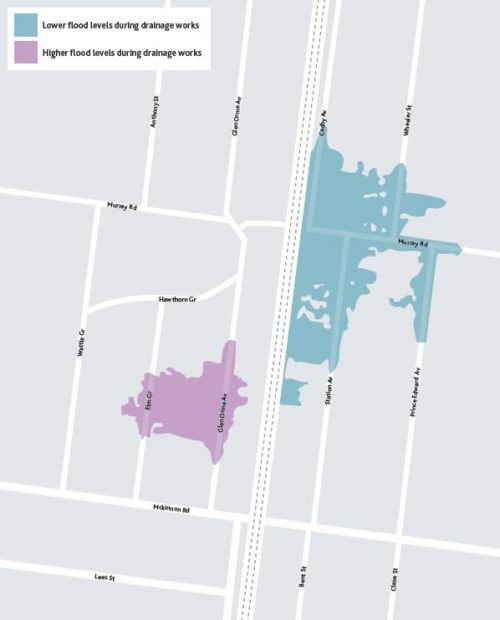 Cold comfort for local residents, but a quick glance at the Glen Eira Planning Scheme shows that the entire area is subject to a Special Building Overlay, so flooding is a fact of life for this area. Blackburn Road in Blackburn is another rail under road grade separation, with the level crossing removed in 2017. The pedestrian subway at Blackburn station used to flood as soon as a single drop of rain fell. So the drainage was upgraded to prevent it, including this massive stormwater detention structure on the south side of Blackburn station. But it had a flow on effect to residents of South Parade, located south of the station. The State Government’s much vaunted improvements to the notorious Blackburn station underpass failed to handle the latest deluge, leading to flooding of neighbouring properties. Properties in South Parade flooded on December 7 after the new drainage system at the station reached capacity and overflowed on to the street. The water was too much for the street’s gutters and flowed over into people’s yards. Susan Rundle said the “horrendous” flooding was the worst she’d seen in a decade. “We measured the water being 70cm deep in our backyard — you can see the line on my husband’s workshop where the water got to,” Ms Rundle said. State Government spokeswoman Hayley McNaughton said the drainage upgrade had been built to standards. “As part of works to remove the dangerous and congested level crossing on Blackburn Rd the project also upgraded the drainage to mitigate flooding,” Ms McNaughton said. Local member and Liberal MP Robert Clark took up the case a few days after the floods. This was South Parade in Blackburn on Thursday evening, as residents were inundated with overflow from the Blackburn rail project’s new drainage system. Backyards have been flooded, garages filled with water and driveways washed away, causing thousands of dollars of damage to residents’ homes. After turning the South Parade shopping strip into a concrete jungle in the name of fixing the drainage, instead the project has turned a quiet residential street into a floodplain. Raising the issue in Parliament a few days later. I raise with the Minister for Public Transport the flooding that has occurred in South Parade, Blackburn, as a result of the Blackburn rail project, and I ask the minister to find out exactly what has gone wrong and to have urgent remedial works undertaken so this flooding does not happen again. Last Thursday evening numerous homes along South Parade were inundated with overflow from the rail project’s new drainage system. After turning the South Parade shopping strip into a concrete jungle in the name of fixing the drainage, the government’s handling of the rail project has turned a quiet residential street into a flood plain. Photos taken by residents show water gushing out through the grill around the top of the drainage pit next to the station and strewing gravel and other debris across the road before pouring downhill into residents’ homes. Last Thursday’s flooding was the third and most damaging of the flood events that have started to occur since the rail project works have been undertaken. Long-term residents say that prior to the rail project works there had been no major flooding in South Parade since a drain was installed in the 1960s. Then raising it again a year later, following more flash flooding. This is South Parade, Blackburn, on Tuesday – flooded yet again by water overflowing from the “upgraded” drainage system installed as part of Labor’s bungling of the Blackburn level crossing removal. The LXRA and the government have known about this problem since similar major flooding almost a year ago, but have done nothing to fix it, leaving residents to suffer every time there’s a heavy downpour. It’s clear that the flooding is coming straight out of the new drainage system – instead of flooding the station’s pedestrian underpass, as used to happen, it’s now flooding residents’ homes all along South Parade. This first happened in December last year. I raised it in Parliament, residents raised it with the LXRA, it was front page of the local paper, LXRA and the government promised to look into it and then… nothing. It needs to be fixed. 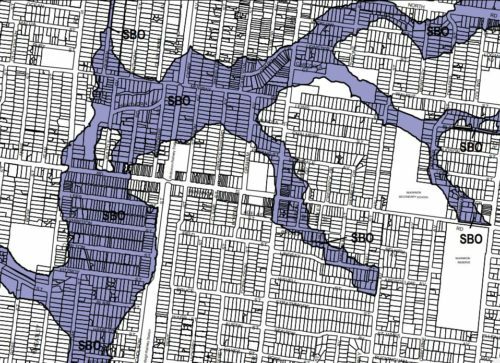 A check of the SES Flood Guide for Laburnum shows that the entire area was already at risk of flooding, thanks to a creek placed underground when the area was first turned into houses. But that doesn’t mean much to residents if the flooding is now worse than before the level crossing removal works. Upgrade works at the Clyde Road level crossing in Berwick also resulted in local businesses being flooded out. The Level Crossing Removal Authority has been flooded with complaints from aggrieved business owners in Berwick amid allegations properties are becoming inundated by stormwater due to botched upgrades. Landlords of Enterprise Avenue have reached boiling point – fearful labourers and construction workers could be rendered jobless if the issue persists. The Gazette understands the problem arose when the State Government began construction at the Clyde Road crossing more than 12 months ago. As the railway line has been elevated, water no longer flows into the natural drainage system and instead gushes towards the rear of the Berwick properties. Despite pressuring bureaucrats for more than a year, Barry Pitcher has not received any answers. It might sound simple, but keeping things dry isn’t easy! That report is typical bureaucratic fluff. I would have been quite cross to receive that. But it is suggestive. The railway crosses the Koornang Rd main drain (once known as Elster Creek) at McKinnon Rd. This drains a large area to the east and north east which is completely built over, and subdivision of blocks into two houses is making the runoff problem worse. Prior to the grade separation the main drain culvert under the railway line formed a choke point; it had a lower capacity than the drain upstream. 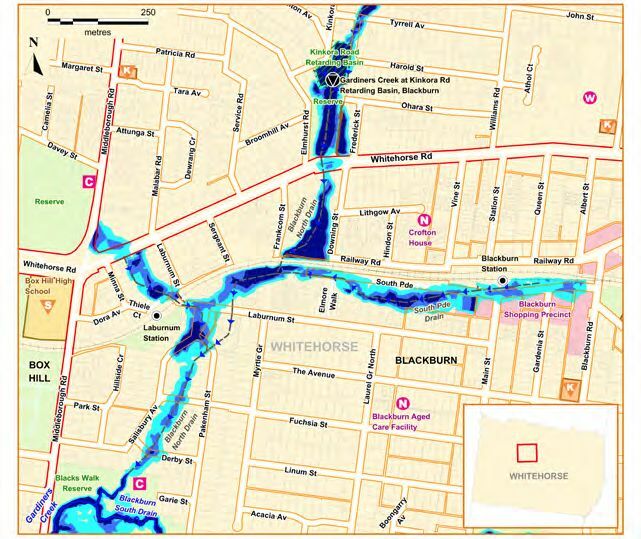 In the 2011 rain storm this resulted in widespread flooding to the east of the railway line (probably exactly the blue area on the map you reproduce). During the grade separation they replaced the culvert under the railway line and took the opportunity to increase its capacity. This solved the problem of the railway line causing flooding upstream of the culvert, but moved the problem to the next choke point downstream. In the 2016 flood, the water consequently backed up downstream of the railway line. It then came out of the drains in Glen Orme Ave and flooded the houses to the west of the road (the pink area on the map). Note that the low point in Glen Orme Ave is between Murray Rd (where the drain is) and McKinnon Rd to the south. The flooding was made worse by further work undertaken in conjunction with the grade separation. Melbourne Water had replaced the regular drains in Glen Orme Ave with massive pipes (about 2 metres in diameter) with frequent huge surface grids. The purpose of this work is not clear. To drain surface water is clear, but what would be the source? Glen Orme Ave is downstream of the railway, so the railway is not blocking the surface water flow. It’s unlikely to be the outfall of the drainage of the McKinnon railway cutting as the sump and pumps are to the south of McKinnon Rd and the outfall would more naturally lead south. Whatever the reason, the large pipe and big surface drain allowed massive quantities of water to flow south from the main drain to the low point, there to be released and flood the houses to the west of Glen Orme Ave.
And what was the new choke point downstream of the railway? I don’t know, but the map is very suggestive. The pink flooding only extended one block – from Glen Orme Ave to Elm Gve – where it reentered the storm water system and got back into the main drain. This suggests that the choke was quite close to the intersection of Glen Orme Ave and Murray Rd. It just so happens that at this point there is a major Melbourne Water installation in the main drain. What it is I don’t know, but there is a very extensive area of panels that can be lifted and large electrical cabinets. I’d lay money that whatever that installation is, it was the choke. Thanks for that Andrew – moving the problem elsewhere sounds just every freeway project in Melbourne! As noted in the previous comment the Ormond station area is part of the Elster Creek catchment which has been low lying and flood prone for its history. Pre European settlement it drained to swampland which was cut through as the Elwood Canal downstream of Elsternwick Park. As the upstream area developed it was channelised and partly directed underground in its upstream reaches. You can still trace the waterway as a line of parks downstream of Allnutt Park. To this day there will be issues with the larger storm events such as the 100 year ARI in this area. Problem with the rail grade separation is you alter the main cross drainage (i.e. the main waterway, usually controlled by Melbourne Water when the catchment area passes a certain size) as well as the longitudinal drainage (i.e. the local stuff – railway itself or streets which are local council of road authority assets). Typically the longitudinal drainage is 10 year ARI capacity for streets with the road network designed to convey excess flow for larger events without flooding property. In older grid layout estates this presents a problem as the road network usually did not account for drainage depressions. As such local sag points will pose extra problems and so may require a higher capacity locally – same would be the case for a pumped out railway cutting. Looks like there the concentration of outflow from the grade separation works has made it worse downstream (to the west of the railway)which is something the designers avoid and would have to provide storage onsite to detain runoff if it was demonstrated it would make downstream conditions worse. The history of creeks being channelised and undergrounded is an interesting one – there are a few in the west of Melbourne I’ve been meaning to write about. The Moonee Ponds Creek might be an interesting topic too. Formally was a series of interconnected ponds surrounded by Pig Face and filled with birdlife. It’s now a drain for a large part of its length. Apparently it was used to transport coal for the steam engines at Dynon. So going by the comments above and keeping it relevant to the post, so if Clyde Rd uses a “rail under” or trench grade separation option, the flooding in the immediate area will get worse, or will a new lot of business/ home owners further up/ down from the corridor be affected by flooding? The flooding at Clyde Road doesn’t seem to be as bad as the examples from Blackburn and McKinnon – maybe the drainage channels were blocked by the works? I wonder what they did at Camp Rd on the Upfield line, with Campbellfield Creek headwaters crossing the line nearby at the Sunshine St culvert? And a retarding (erk, don’t like using that word!) basin on the other side of the Ring Road? Does this explain the LXRA using up the bridge path over the Ring Road? Likewise, any future Barry Rd level crossing removal would have to deal with Merlynston Creek headwaters crossing nearby. over-land flow, assets and waterways, and that the project is feasible, safe and possible for community use. Also note the existing M80 underpass at Sydney Road is a presumably pumped low trap spot lower than the Upfield Line underpass at Camp Road where there is a distinct uphill grade from the creek to the former crossing site. The road between the underpass and Campbellfield Creek was built on bridge structure at ground level indicating poor conditions (you can see the expansion joints in the road) similar to what they did building the road through the former Sunshine tip site. Webster Street in Dandenong is another interesting one – the ‘obvious’ grade separation would be to bring the road under the currently elevated crossing except the only problem is it is right next to flood prone Dandenong Creek which itself was channelised through the area to alleviate flooding years ago. I agree Webster St would be an interesting one, I suppose how valuable is the access to the area could the LXRA opt to just close the access and detour the traffic elsewhere say “compensate” by adding a thrid lane on Dandy-Frankston road. Otherwise definitely would see a road over option (possibly if possible even slightly lower the rail corridor so a reverse Seaford Rd). I noticed the LXRA has placed updated information and video on all the priority crossing removals with rough designs on how they are being removed. A update/answering last reply in regards to Webster St looks like doing a cheap by just closing the road probably won’t sit well for the locals so will be removed using a hybrid design (raising the rail corridor and slightly lowering the road). Another thing which is irrelevant to this post but Evans road in Lynbrook, Marcus wasn’t this crossing “removed” years ago by blocking off the road using concrete barriers, looking at Google maps (probably not updated) the barriers are there but I suppose doesn’t look like does much to deter traffic from using the crossing. The City of Casey temporarily closed the unsealed section of Evans Road in 2005 due to safety concerns, and it has remained closed since, despite the road having been sealed in the meantime.